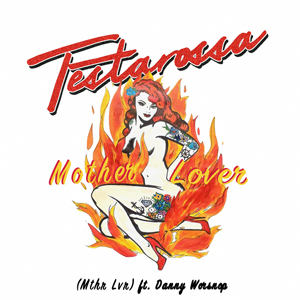 Charlotte, NC Hard Rock Band TESTAROSSA has released the official music video for "Mother Lover", off of their upcoming, debut LP, Don't Be Late For the Party. directed/produced by Steven Billings and Joe Potts, "Mother Lover" features guest vocals by Danny Worsnop (ASKING ALEXANDRA). TESTAROSSA is a four piece Rock-N-Roll extravaganza hailing from the suburbs of Charlotte, NC. The sounds produced by the band are reminiscent of past decades, but still retain a fresh, modern vibe. The thunderous sounds produced by Buddy Radford's drum kit are enough to make Tommy Lee blush. Blake Webb, the bassist, has a remarkable ability to hold a groove and lend a solid foundation for some infectious hooks. Jordan West's guitar work is second to none and is eerily evocative of guitar virtuosos from days gone by. Take the sonic masterpiece created by the three, then add Colten Bell's bourbon and pipe tobacco tinged howling vocals and the results are like nothing else. TESTAROSSA can only be described as Rock-N-Roll. The songs are carefully crafted to induce an uncontrollable urge to party and sing along. Subject matters of their songs range from tongue 'n' cheek teenage angst and overtly confident claims of unrivaled passion -- all the way to losing close friends to addiction and unrequited love. A live performance from TESTAROSSA is a wide ranging, rollercoaster of emotion that never loses focus on the main objective, having a good time. The sounds emitted by TESTAROSSA are bound to make your body shake like a bad ball joint in your daddy's 1989 Z28 Camaro.